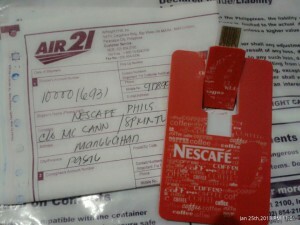 Just received my 2GB Nescafe USB Flash Drive! I’ve been a long time fan of Nescafe Points in Facebook. All I want to retrieve that time is a Nescafe Mug but unfortunately there were no stock. As 2013 opens Nescafe has restock all of its premium rewards. While browsing to its premium rewards, my attention was caught by this 2GB Nescafe USB Flash Drive. Nice post, very helpful for me. Thanks for sharing such a great post and amazing informations.